On our farm we have been able to start our vegetable starts early and extend the growing season. We didn’t really have the money to spend too much on a greenhouse so we decided to make a high tunnel. We made ours for $600 and it’s 20 wide x 48 long. High tunnels offer plants protection from wet, saturated soils and low temperatures in the spring and fall, thereby extending the gardening season. This can translate into earlier maturing fruits and vegetables. For centuries gardeners have been extending the gardening season using glass jars, hot caps, cold frames, and various types of greenhouses. 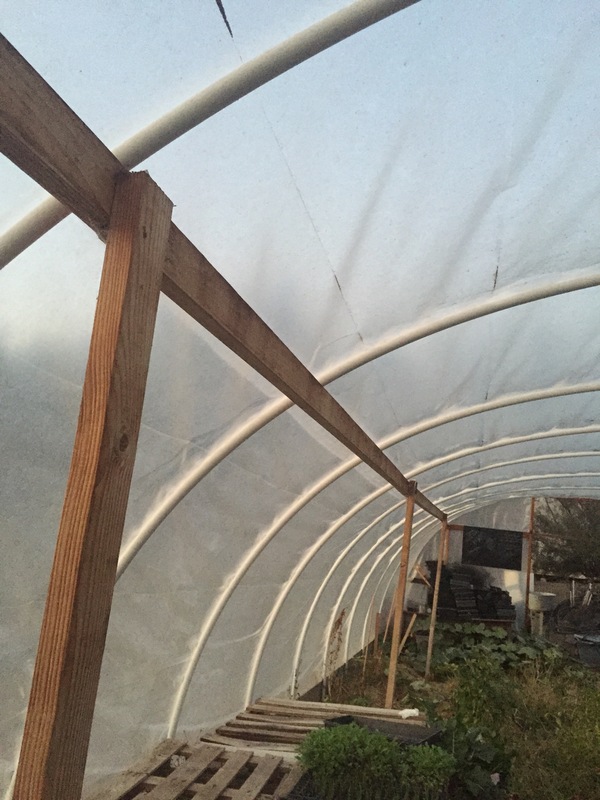 High tunnels are structures generally constructed of a metal or PVC frame covered with a single layer of 6-mil greenhouse-grade plastic and are considered nonpermanent structures. They have high ceilings comparable to those of greenhouses, which allow gardeners to comfortably enter and tend plants, even when it’s raining. High tunnels differ from greenhouses in that plants typically are grown directly in the ground instead of in pots and they do not have permanent heating or automated ventilation systems.Greenhouses are more permanent, which in my eyes has its disadvantages because disease builds up after a few years in greenhouses. If you live in a cold area, portable propane or kerosene heaters can be used to heat high tunnels in early spring and fall when below-freezing temperatures are forecasted. Ventilation is accomplished by manually or mechanically rolling up the plastic sides of the tunnel to allow crosswinds to circulate through the high tunnel. For us just opening the doors is enough. What Are the Benefits of Gardening in High Tunnels? Many benefits exist for growing plants in high tunnels related to temperature, pest management, harvest quality, and yield. Farmers/ Gardeners can reap the rewards of earlier harvests compared to plants grown outdoors. Temperatures in high tunnels are more constant than outdoor temperatures during the gardening season, which is optimal for plants that grow best in predictable temperatures. Researchers have not observed many pests when growing crops in high tunnels, which can translate into a reduction in the total amount of pesticides applied to plants compared to those grown outdoors. Pests that have been encountered tend to be those associated with greenhouses, for example, white flies or aphids. Some powdery mildew has also been observed on plants growing in the high tunnels. Gardeners who use biological pest management may experience more success in high tunnels compared to outdoors because predators are confined within the high tunnel. In general, all the crops grown in high tunnels have had higher yields with better quality than those grown outdoors. High tunnels are lower priced than greenhouses at a cost of about $2.38 per square foot compared to $19.89 to 37.48 per square foot for a hobbyist greenhouse. The intensity of the sun governs the temperatures inside a high tunnel. On a yearly average, the temperature in a high tunnel is 8.4°F (-13.1°C) higher than outdoors. Temperatures will vary depending on weather conditions, time of day, and time of year. 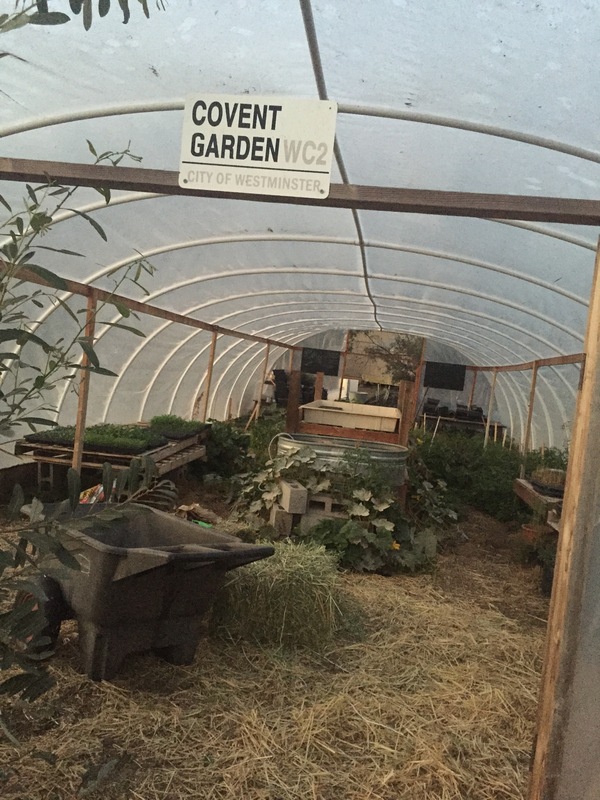 For the most part, it will be cooler inside a high tunnel on a cloudy day than on a sunny day, in the morning and evening than in the afternoon, and in the spring and fall than in the summer. Ventilation in the morning to exhaust moisture that may build up at night due to transpiration of the plants and also to keep the air temperatures inside the high tunnel from exceeding 85°F (30°C). Gardeners can use other season-extending technologies within a high tunnel to extend the gardening season beyond the capabilities of the high tunnel alone. Before planting in a high tunnel, soil temperatures should be a minimum of 10°C (50°F). Raised beds and mulches can be used in the high tunnel to reach minimum soil temperatures early in the year. Until air temperatures within the high tunnel are above freezing, row covers, or even thermal blankets should be used to protect plant canopies from cold damage. We have a aquaponics tank we built in the middle of our high tunnel that acts as a sistern and keeps the greenhouse warm in the winter and cool in the summer. I will tell more about that in another post. 1- build the base. We live in a high wind area, so we need extra structure to hold up our high tunnel, the smaller ones do not need a base. We made the base with douglas fir 2×10, 12 ft long, we used 4 on each side and 2 on the front, 2 on the back. 2- Put up the PVC. We used rebar rods that we pushed into the ground and then put the pvc over that. In order to really hold our pvc good in the wind, the rebar needs to be ablest 4 ft ( 2 ft above ground, 2 ft under ground). As you put up the pvc pipes, you will have to connect the middle pieces. You should use pvc glue to really bind the PVC connection pieces together. 3. Build front & back frame with wood as well as doors. 4. 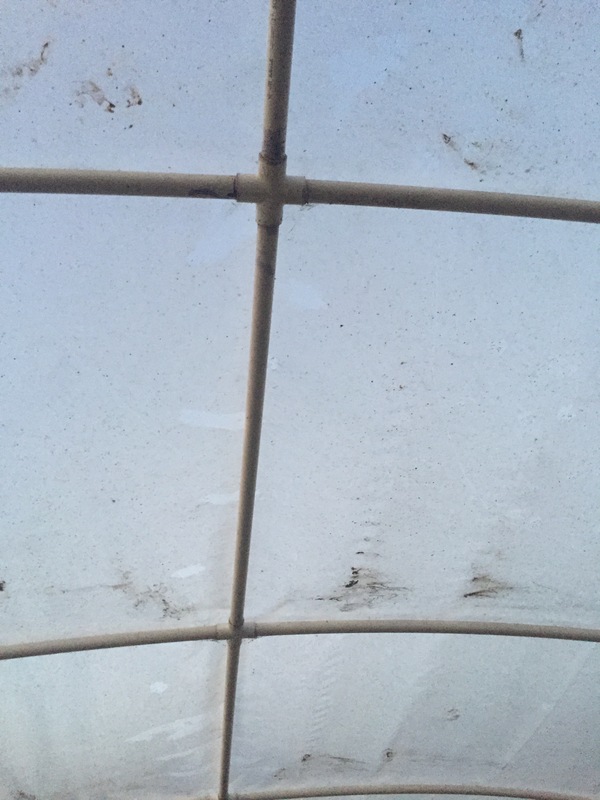 Put plastic over greenhouse. Once we put the greenhouse plastic on, you will need to fasten it. If you were going to roll up your sides here is where you would do things different. We don’t roll up our sides. 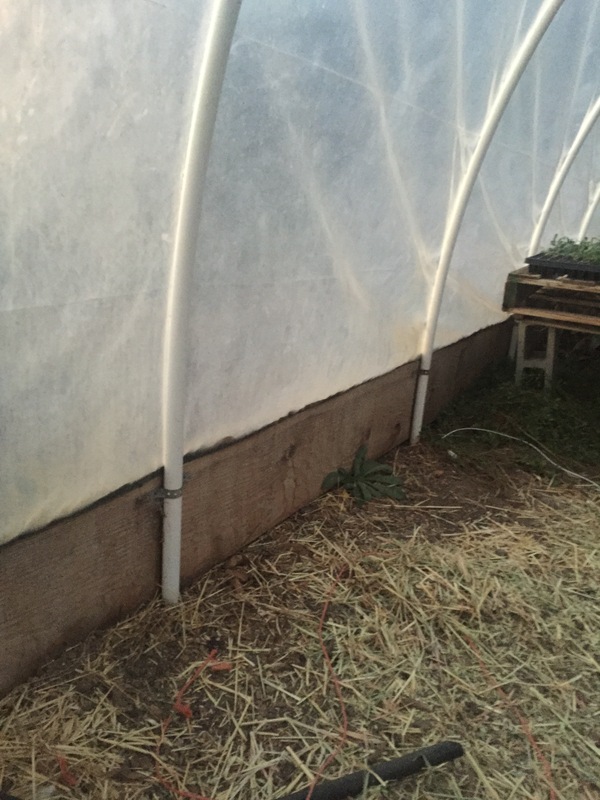 We used furring strips that we braced on top of the green house so it was nice and snug screwing the greenhouse plastic into its permanent area. We then cut off the remainder of the plastic with a razor. The front was tucked & folded in a way that was sure not to allow pooling of water in the folds. Did I just make that sound super easy? Well it is! Either that or my husband makes everything look way to easy!